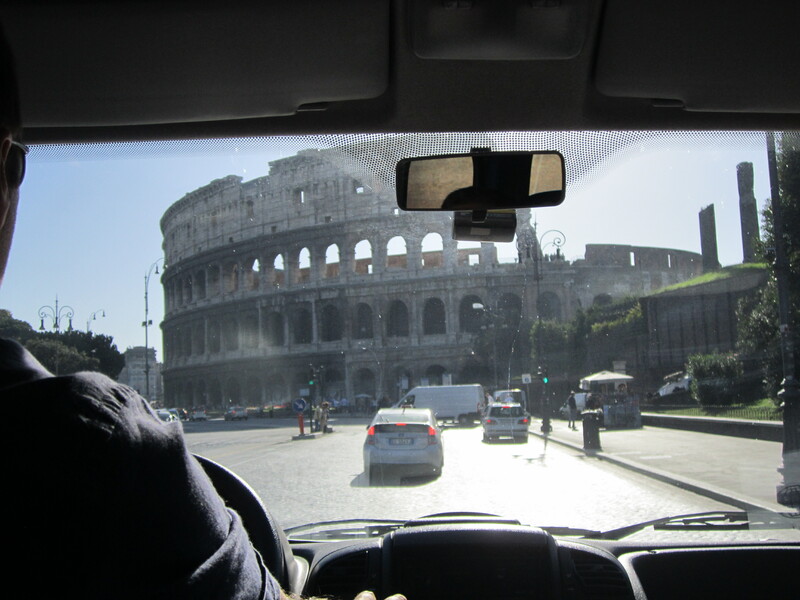 Wendy and I boarded our mini bus and set out for the Colosseum. We enjoyed the many sites along the way of shops, cafes, people and lots of traffic. 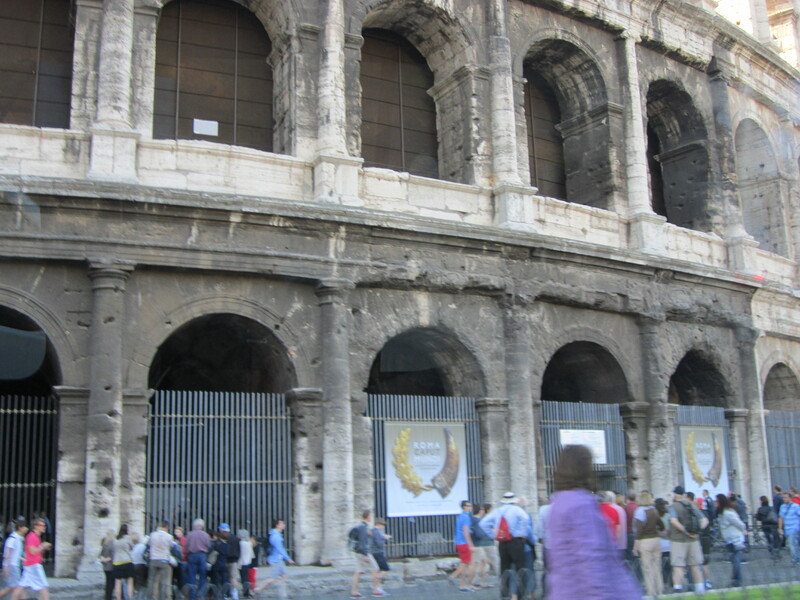 As we approached the Colosseum it definitely was the major presence in the area. Once again, seeing a picture of something in a book versus real life is totally different. In its day, the Colosseum must have been amazing, but it now gave me the impression of something that needed to be treated with great delicacy. I guess I had never thought of it that way before. Monumental in size and history it was spectacular. But thousands of years of wear and tear, as well as being scavenged by people to build other structures, have taken its toll. In the pictures you can see holes covering the entire structure. 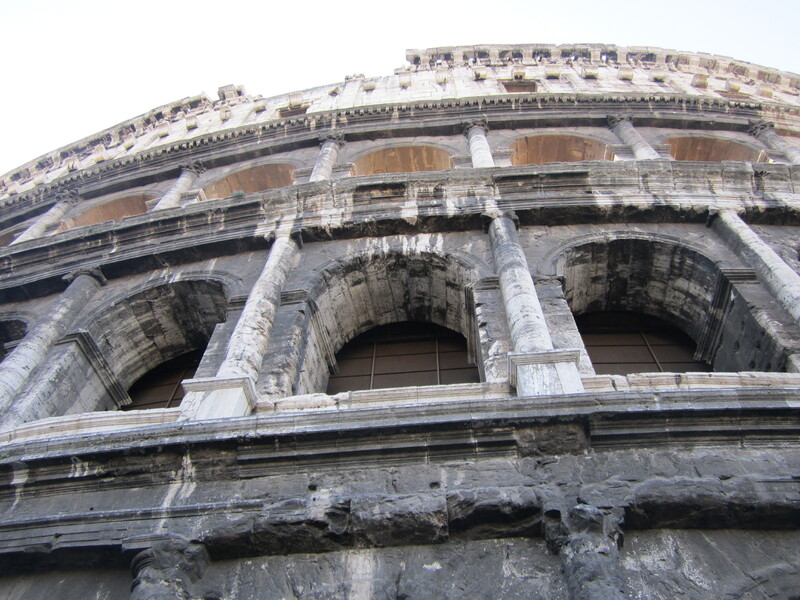 The holes are where materials – iron and marble – were removed for other building projects. Of course it is now being preserved and protected, and there are reconstruction efforts going on as you can see from the many scaffolds. 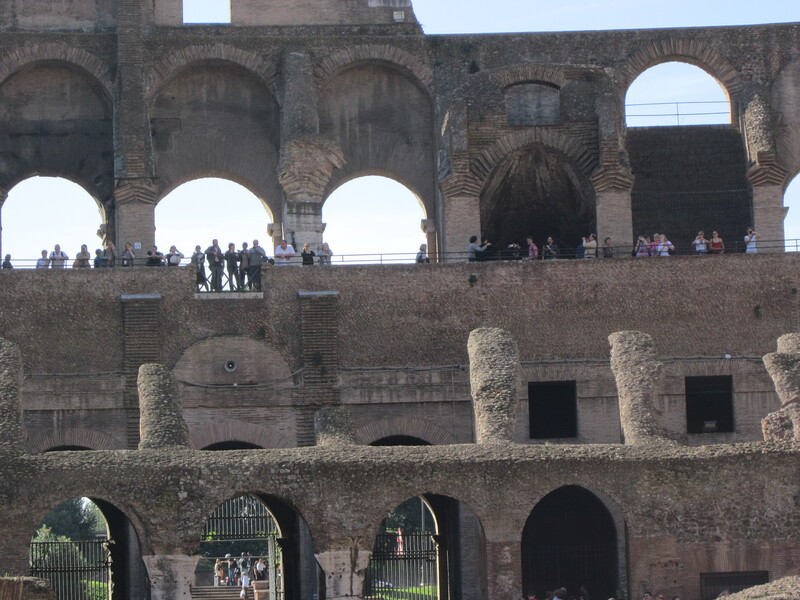 The Colosseum itself was approximately 160 feet high, could hold 55,000 spectators and had over 80 entrances. It took about 8 years to finish the structure and was built on the site of an artificial lake that was originally part of Nero’s gardens in the center of Rome. It consisted of four stories above ground and one story below ground where the animals were kept. There were also mechanical devices that were used to raise the animals to the center of the arena. There was also a canopy, made from sails to shield the spectators from the sun, which could be pulled over the structure in a matter of minutes. This was accomplished with giant poles, ropes and about 1000 men. 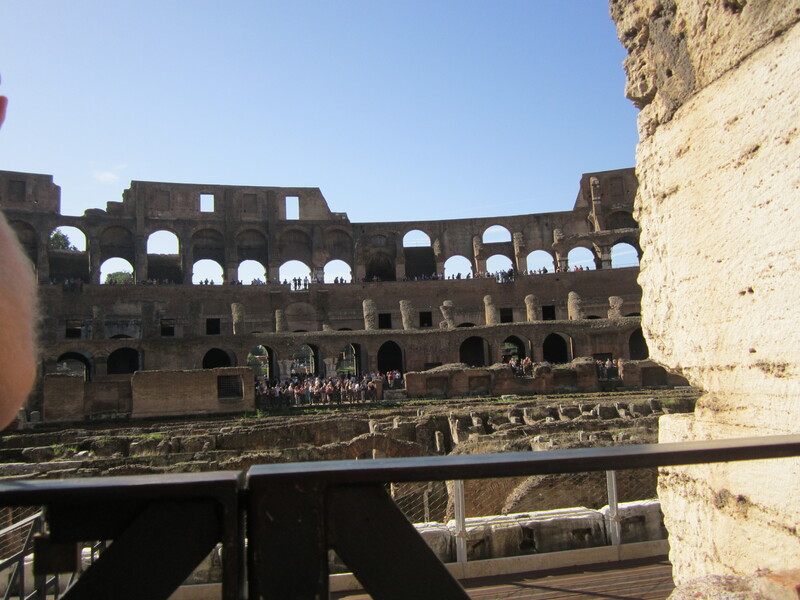 The interior of the Colosseum was very accessible. Entering at the ground level the floors were mostly flat stone and ramps. At one end there is an elevator that can be used to access all floors. 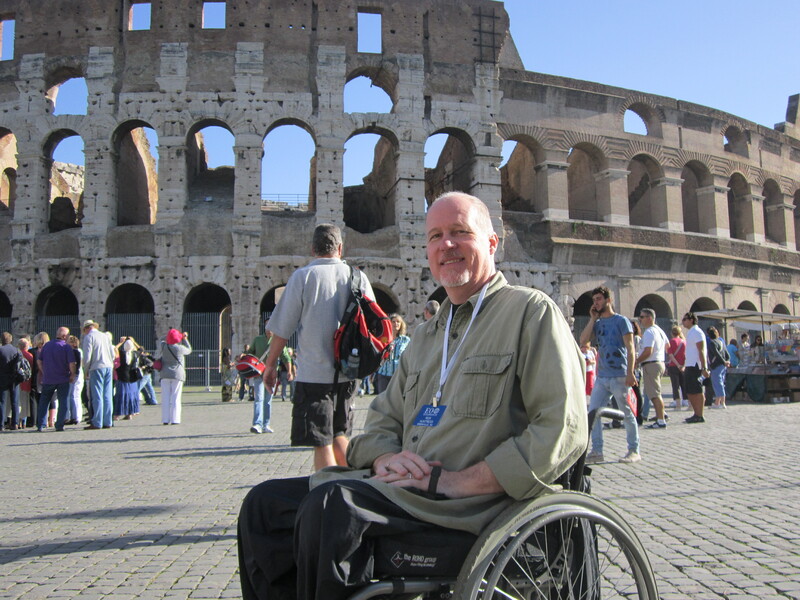 As with most ancient sites that I have been to, I just take my time and bounce my wheelchair over the rough spots. Even though the surface may be flat, there are cracks between the stones and lots of holes that love to catch my front wheels. So I strongly advise the slow and easy approach to getting around. That is much better than taking a nose dive from my chair. 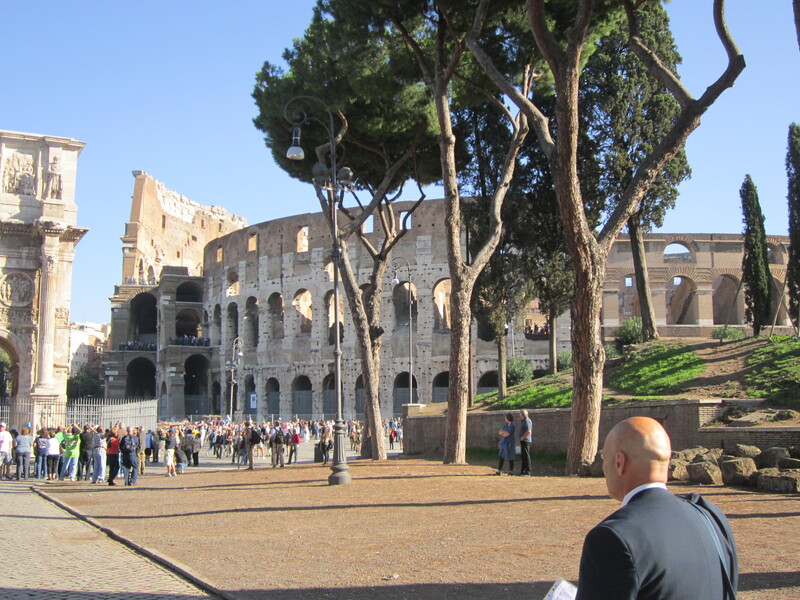 The grounds around the Colosseum were very beautiful with lots of trees, flowers and other ancient monuments. The pine trees around here were beautiful. They are Italian Stone Pines and are very different from the White Pines that I am familiar with in Maine that grow straight and tall. They are referred to as Umbrella Pines and branch out to create a lush looking canopy. 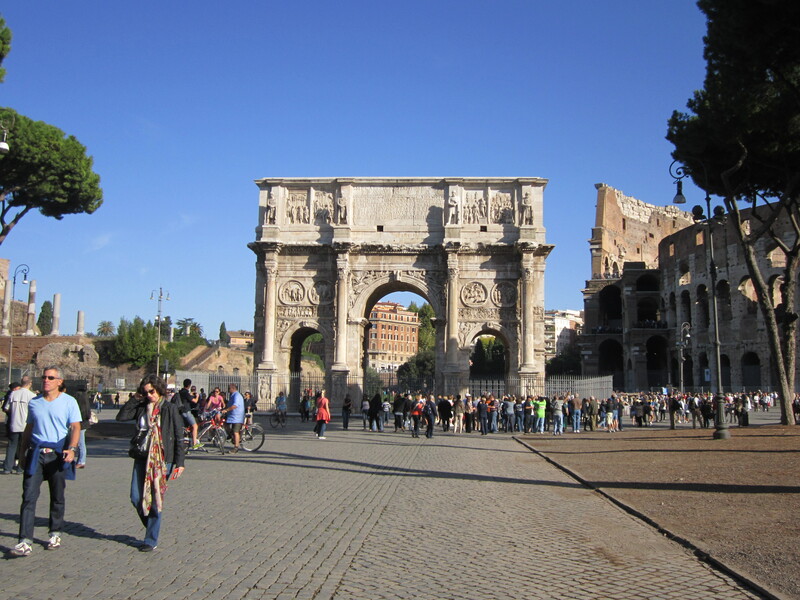 There is also the triumphal Arch of Constantine, which is a towering 69 ft high, just outside the Colosseum. We also saw the base of Nero’s statue that has been excavated. It is approximately 75 square feet and was originally covered with marble. Nero commissioned the 120 ft. Colossus of himself to be made from bronze and placed outside of his private palace. After the death of Nero, the head of the statue went through several changes depending on who was emperor at the time. 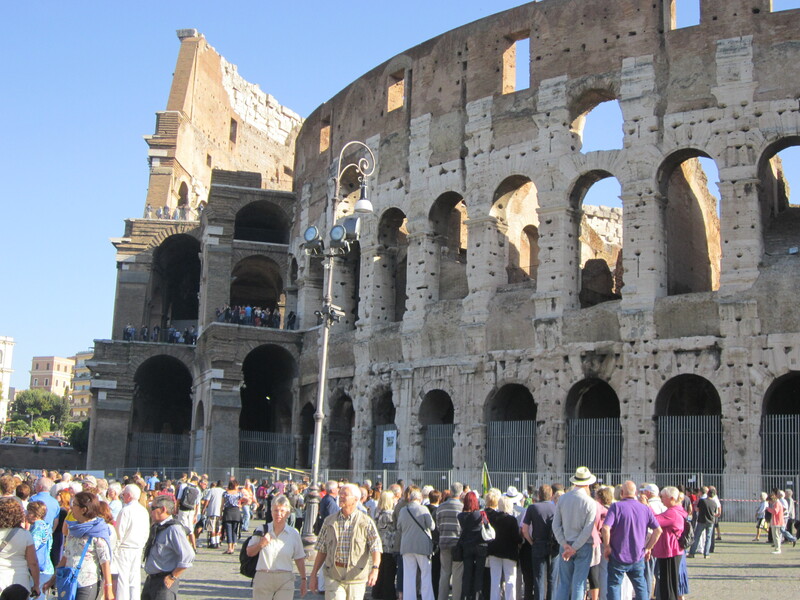 It was later moved to the Colosseum area around 128 A.D., but there is no trace of the statue today. 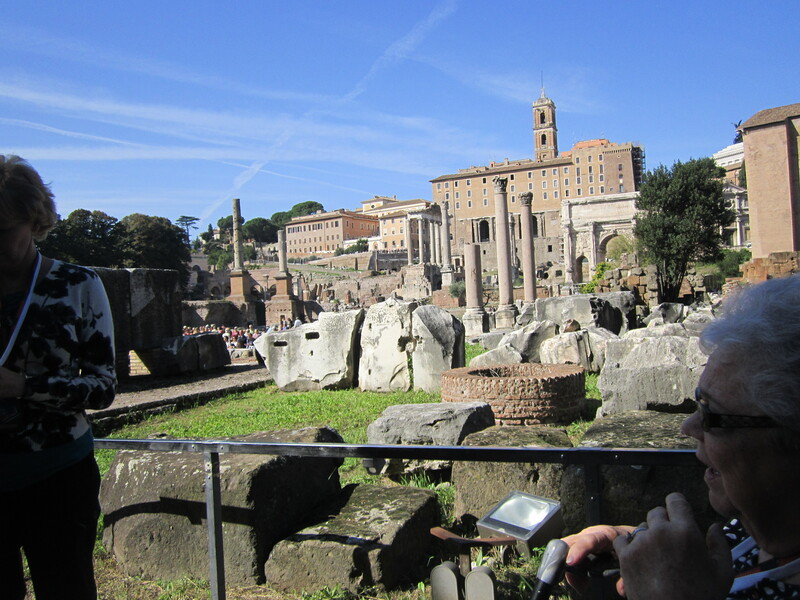 After leaving the Colosseum we went on a small trek to the Roman Forum. On this walk we saw many beautiful and ancient buildings all around us. 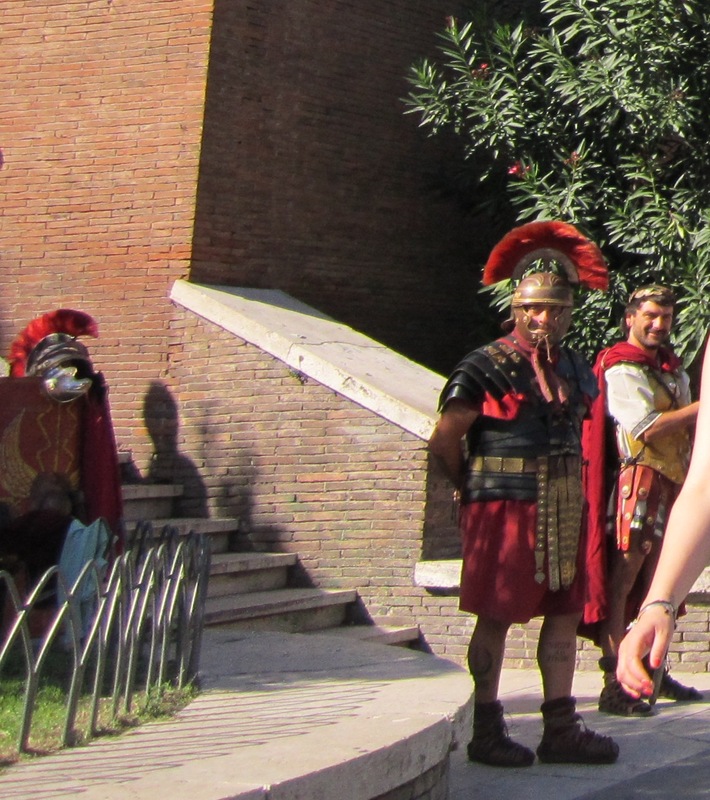 And of course what would a tour to the Colosseum be without seeing some Gladiators! Going into the excavated Forum was very “interesting” for a wheelchair. It was a flat paved surface but the incline was extremely steep. My guide had my wheelchair and backed me all the way down. 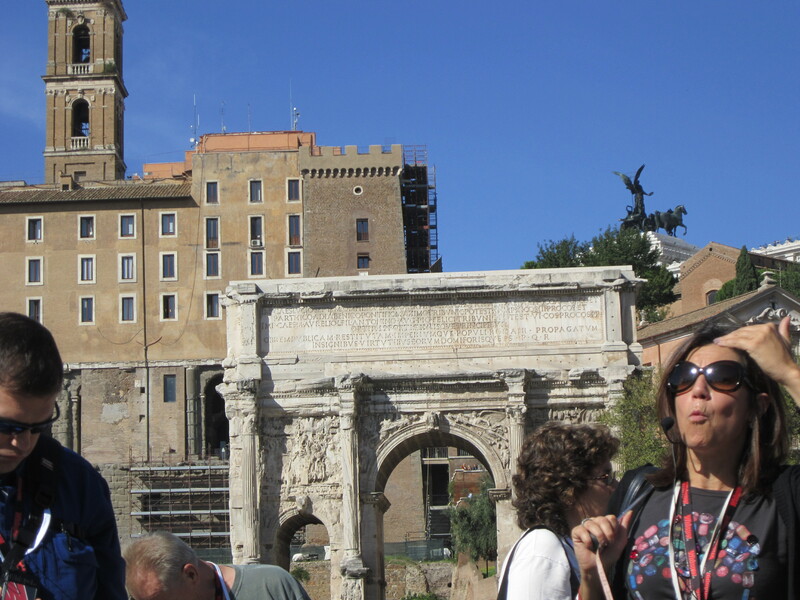 For centuries the Forum was the heartbeat of Roman public life. Everything important that happened in Rome happened at the Forum: processions, speeches, commercial activity, Roman Senate meetings and elections all took place here. 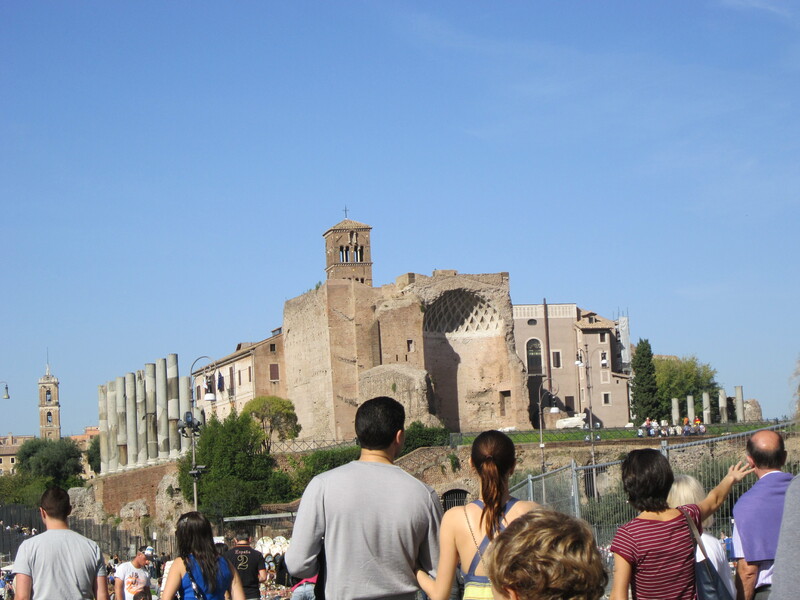 The Forum also was the home of the ancient city shrines and temples. Much is still in the process of excavation and restoration but the temple complex of the Vestal Virgins is very well preserved along with many other monuments, arches and shrines. All of us then boarded the busses and headed to Civitavecchia where we would meet our new home for the next 14 days, Mariner of The Seas.